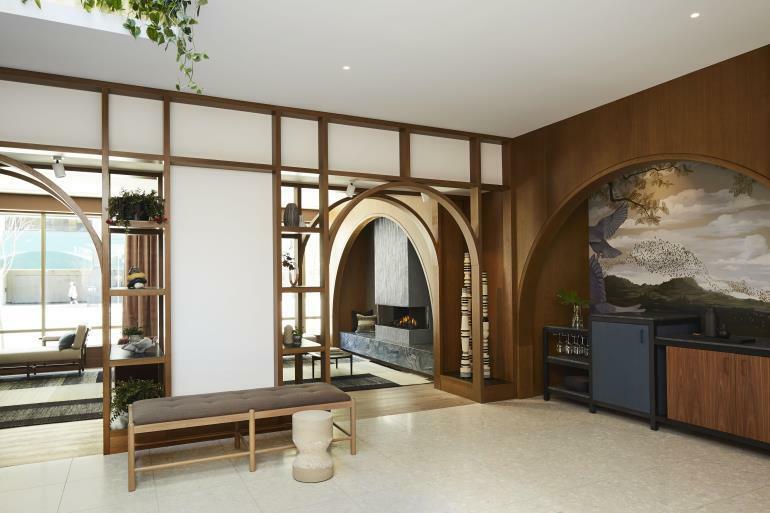 Denham, United Kingdom, 2018-Jun-25 — /Travel PR News/ — Kimpton Saint George, located at 280 Bloor Street West between Huron and St. George Streets, opened its doors on June 19, 2018. The boutique hotel company’s first ever Toronto location is a sophisticated-yet-playful respite along the Bloor Street Culture Corridor bridging luxurious elements of bordering Yorkville with the bohemian hipness of the Annex. With design and interiors conveying the nuances of neighbourhood life from Toronto-based interior design firm Mason Studio, in collaboration with Kimpton’s Ave Bradley, Global SVP Design & Creative Director, and Diana Martinez, Design Director, Saint George brings an exciting new 14-story hotel that seamlessly integrates elements of Toronto’s culture and personality. Its 188 artfully designed guest rooms, including 20 suites and a Presidential Suite, give guests a distinct sense of place with gentle nods to the Annex’s heritage homes and community in its contemporary design and all of the right residential touches. As central to the hotel’s design story, virtually all of the art pieces are original works by Canadian artists, and every finish, colour selection, piece of furniture and object has meaning and a story to make guests feel the warmth and community of Toronto. Beginning with guests’ arrival, the hotel exterior features a hand-painted owl mural by renowned Toronto street artist, Birdo. The owl’s wit and curiosity symbolizes how guests unravel the hotel’s sense of discovery from one room to the next. From a heightened view of the city, the owl’s gaze shows the Toronto skyline – a beautiful view of the city from above. In the reception check-in area, a sophisticated and original hand-painted mural by artist Tisha Myles depicts a misty Toronto-inspired scene, a nod to traditional landscape paintings. What’s more, a blue jay is seen flying over the mist, casting a patriotic spell over the distinguished piece of artwork. From the reception area, guests naturally flow into the Living Room, a refreshing departure from the fast exchange that is typical of a classic hotel lobby. Anchored by a focal point fireplace, the space is hospitable, inviting, casual and comfortable. The Living Room is the heart of the hotel, with a design that facilitates socialization and the locale for Kimpton’s popular morning coffee and tea service and evening social hour. Fittingly located within steps of the Royal Conservatory of Music, Kimpton Saint George embraces the local community’s connection to music. Each of the hotel’s suites are equipped with TEAC turntable systems and vinyls from a variety of Canadian artists specially curated by Kimpton’s Director of Music, Lauren Bucherie, in collaboration with local record store, Sonic Boom Records. From the guest room corridors to the elevators, the music is carefully selected for every zone of this hotel – a nod to the many musicians that got their start in this neighbourhood, particularly through folk music. Guest amenities at Saint George include all of Kimpton’s signature offerings, such as its “Forgot It? We’ve Got It!” menu of travel and vacation essentials; luxurious Atelier Bloem bath amenities; free Wi-Fi for IHG Rewards Club members; and health-minded wellness options, such as complimentary use of custom designed PUBLIC bikes, 24-hour access to the hotel’s fitness centre and in-room yoga mats. As with all Kimpton properties, Saint George is pet-friendly, welcoming four-legged guests with no additional fee or deposit. Located on the ground floor, Saint George’s 1,500-square-foot pre-function meeting and events space was designed to provide a place for work and play, specifically catered to intimate gatherings. A paradox to the vibrant meeting room, the anterior 400-square-foot pre-function lounge sets a cooling, calming environment with its moody, darker design scheme that provides an instant relaxing vibe. As guests make their way into the Peregrine Room, the 1,100-square-foot meeting space, they are immersed in a daylight-soaked, open and airy space with residential touches and a soft colour palette. Eclectic furnishings, used in both spaces, are interchangeable for workshops, cocktail parties or business meetings. Layered, architectural window shutters can be used at the guests’ discretion to integrate more privacy and lighting control into the space. Adjacent to the hotel, and also accessible through Saint George’s living room, The Fortunate Fox is a hip gastropub that offers a familiar yet refreshing experience. The Fortunate Fox is an elevated take on the classic pub, with a menu of made-from-scratch items and a great selection of local craft beers and cocktails that can be paired with any dish. A soon-to-be neighbourhood staple, The Fortunate Fox has something for everyone – travellers, locals and students. The restaurant will be open for breakfast, lunch and dinner and will be servicing the hotel’s meetings and events, as well as in-room dining. To learn more about Kimpton Saint George, book a stay or see the hotel’s local package offerings, visit www.kimptonsaintgeorge.com or call reservations at 1-888-563-2004. Follow the hotel on Facebook and Instagram for an inside look. San Francisco-based Kimpton® Hotels & Restaurants is the acknowledged industry pioneer that introduced the boutique hotel concept to the United States in 1981. Anchored in one-of-a-kind experiences, Kimpton operates more than 60 hotels and 70 restaurants, bars and lounges across urban locations, resort destinations and up and coming markets in the United States, Europe and the Caribbean. Time and again, Kimpton has demonstrated its commitment to creating spaces and experiences that are centered on its guests. From inspiring design that evokes curiosity to forward-thinking flavors that feed the soul, every detail is thoughtfully curated and artfully delivered. The Kimpton experience is always meaningful, unscripted and ridiculously personal. Kimpton is highly regarded for its workplace culture and has been consistently recognized on the FORTUNE magazine “100 Best Companies to Work For” list. Empowered employees bring to life the heartfelt guest experience that has come to define Kimpton. In January 2015, Kimpton became part of the InterContinental Hotels Group (IHG) family of hotel brands. For more information, visit www.KimptonHotels.com. Debuting June 2018 at 280 Bloor Street West, Kimpton Saint George is a 14-story, 188-key, artfully designed hotel, including 20 suites, a Presidential Suite and approximately 1,500 square feet of ground level meeting space. Distinguished for its residentially-inspired design, local touches, dynamic gastropub dining, and genuine service, Kimpton Saint George is located in the vibrant Annex neighborhood, walking distances to world class museums, attractions, and independent shops, cafes and galleries. For more information, visit www.kimptonsaintgeorge.com and follow along on Facebook and Instagram. This entry was posted in Hospitality, Hotels, Travel, Travel Services, Travelers and tagged Bertrand Mangeot, IHG, Kimpton Saint George, Toronto. Bookmark the permalink.